As most of you know, this blog is dedicated almost exclusively to stuff that you can pick up in the freezer aisle, but that doesn't mean we won't jump at the chance to try something new. Case in point, Desserts that Matter asked if I would be willing to look over their flavor list and pick out a handful of flavors to try out on the blog. They are a boutique ice cream manufacturer that serves the New York Metropolitan Area but today, well, I'll be trying them from comfy ol' central Mass. As you can see, I have a pretty wide selection of flavors to try. I tried the Fruti di Bosci Cheesecake Ice Cream first, probably because it's so unique looking. I mean, who doesn't love tons of swirl and a variety of mixed berries? The pleasant fruit flavor goes delightfully with the cheesecake flavor. The even more unique thing here is that there is a certain thickness to the texture profile that adds a bit of realism to the cheesecake flavor. It feels like more than just ice cream. I give them major props for this one. Well done. Next up was their Cocoa Gelato, and whoa is it dark and dry. You can really taste the cocoa. Those that adore rich, complex chocolate flavors, this one is totally for you. Mint Chocolate Chunk Ice Cream was next and I approve.... though Nick would hate it. It's got that same great buttermint vibe that Talenti has, plus their high end texture is great for delivering this kind of flavor. It's super smooth and was easy to inhale. Strawberries and Cream was next and as someone who digs a rich strawberry ice cream, I was a bit let down. It's not that the quality is bad, it's that the execution isn't potent enough for me. While the base looks pink, it tastes pretty mild. The majority of the strawberry flavor comes from the occasional strawberry chunk, and that's just not enough for me. 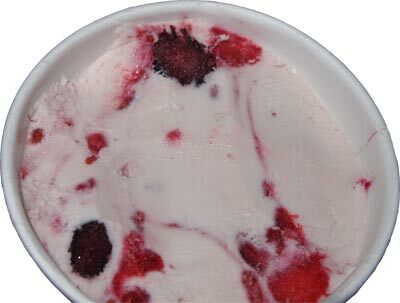 On Second Scoop: after sitting for a few weeks, the strawberry seems to be popping a bit more. I do appreciate that it's a clean (non-artificial) strawberry, but now I'm not sure how to rate this one. Last and certainly not least (potent), I decided to go really unique with their Pomegranate Chip Ice Cream. That's right, Pomegranate on it's own. No blueberries or anything else. I know it sounds like uncharted territory for me, but after those excellent H-D pomegranate bars, I couldn't resist. How is it? BRIGHT. You could have told me it was a sorbet and I would have believed you. It almost feels like it's bubbling on my tongue. To be honest, I couldn't really handle it on the first scooping. When it breaks down in your mouth, there is a bit of a tart / sour kick on the end, and we all know I don't do sour. It did get easier on the second scooping though, and the chocolate chips help bring things back down to earth a bit. This one definitely isn't for everyone, but now that I think about it, it kind of reminds me of that Kemps little froyo cup that I tried long ago. [The good news is that I'm a lot more mature now than when I wrote that review]. Ok, that's it for now. This is obviously a quality product so I'm glad I got to try it. 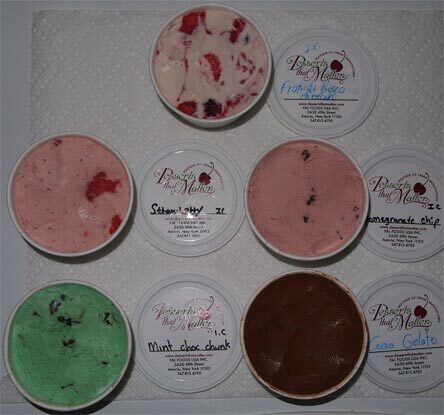 Big thanks to Desserts that Matter for letting me showcase some of their standard flavors. If you want to read about more of their flavors, go here. If you are in their area, they can also use their 40 years of experience to make custom flavors for your event or business. For everyone else, you can check out their dairy-free products that are under the DF Mavens brand.